What valve would be needed for this and a tub filler? I'd like to have a Roman tub filler with a handshower where the handshower is installed near the middle to the head end of the tub, 3 - 5 feet from the main filler and valve. I've seen pictures so I know its possible in some way. Would this Roman Tub Handshower with Transfer Valve be able to be installed 3 - 5 feet from the main valve and filler? Would a special valve be needed or would the standard R4707 Flexible Roman Tub with Hand shower Rough work? Thanks! Thank you for your question. It is possible to install Delta Faucet model # RP14979 farther away than normal from your main valve and spout. You will need to install extra piping to reach the transfer valve that is not supplied by us. You will not need an special valve as the transfer valve will pull the water to the handheld shower. Is this compatible with any Delta faucet? 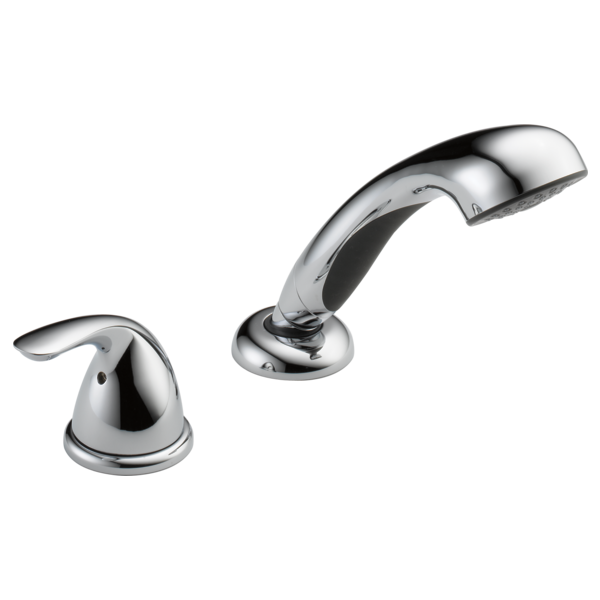 I already use a Delta 3-hole widespread tub faucet (filler with knobs). Can I add this onto my existing faucet set-up or must I buy a whole new faucet-with-hand-shower combo? I saw your diagram but don't understand as diverter and hand shower appear to be installed on a lower elevation from the tub filler and knobs, which does not make any sense. What line should the transfer valve line run to/from; can you please explain? Thank you for your question. Delta Faucet model # RP14979 is used when you are adding a handshower to an existing roman tub faucet. You will need two holes for the installation and they can be installed along the same lines as the faucet. I have a Roman Tub faucet and spout. Three holes for hot/cold/spout. Can this handshower be used? You would need an additional two holes for this, and access to the valves underneath. What's the size hole required for the threaded pipe (which houses the diverter assembly) which protrudes through the tub rim? In followup, will using a single line feed have any effect on flow rate and can the valve shut off the tub and sprayer at the same time? How does this connect to the existing rough in valve? I have a roman tub faucet with two handles. I also have space to cut the two new holes for the hand shower and transfer handle. My question: How does this unit connect to the existing valve? Or do I need to buy a new valve to connect everything? Can i use RP14979 with a single supply line that provides the hot &amp; cold water? Will the transfer valve act as a &quot;mixing valve&quot;, if I hook it directly to the hot and cold sources? IN other words, I don't want to be able to use the hand shower ONLY when the main tub filler is on. I want to be able to fill the tub, with a Trinsic wall mount, and be able to use the hand shower, and control it from inside the tub. OR, would I need to get a 2nd R3510-WL valve and hook it to the hand shower?